Today in “Hoo, boy”: Hillary Clinton’s election memoir, What Happened, includes a passage in which she writes that Bernie Sanders’ die-hard supporters are partially to blame for Donald Trump’s win. The excerpt—which has been shared by The Daily Dot and is currently making the rounds—acknowledges Sanders’ support following the Democratic primary. But Clinton also claims her rival for the nomination undermined her through innuendo when he couldn’t call her out for more specific failings: “Because we agreed on so much, Bernie couldn’t make an argument against me in this area on policy, so he had to resort to innuendo and impugning my character.” And all that bashing then paved the way for the “Crooked Hillary” part of Trump’s platform, she writes. Clinton goes on to call out the “so-called Bernie bros” who attacked her supporters online in ways that were “more than a little sexist”—12 percent of whom, according to NPR, went on to vote for Trump in the general election, in case you thought it was just harmless blustering. And while she believes that Sanders was just as opposed to Trump becoming president as she was, Clinton also thinks that he prioritized “disrupting” the Democratic party over keeping a racist out of the White House. 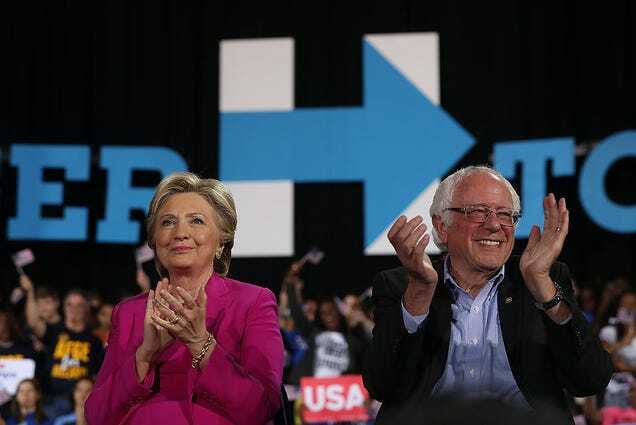 Ultimately, Clinton thinks Sanders is “fundamentally wrong about the Democratic Party,” a party that achieved significant social and economic reform under Democratic presidents from Franklin D. Roosevelt to Barack Obama. Trump doesn’t read, so he’s not likely to fire back, but a new chorus of “lock her up’s” should be coming from Sanders’ supporters any minute now.